So much of Stephen Fry and Hugh Laurie's appeal appears to lie in the clash of attitudes they had between themselves and other comedy partnerships. The gothic interpretation of Laurel and Hardy as demonstrated by Rowan Atkinson and Tony Robinson in Blackadder, and the live-action Looney Tunes mentality of Rik Mayall and Ade Edmonson may have been riotous company to keep. However, keeping such company resulted in a space being left for the calmer, gentler approach that Fry and Laurie would adapt for the bulk of their working partnership, culminating in Jeeves and Wooster, that period piece of delightfully nincompoop misadventures experienced by England's elite. Airing between 1990 and 1993, the dramedy is just one chapter in the then still-flowering Fry and Laurie double-act, although given the duo's desire to bring P.G. Wodehouse’s Bertie Wooster and Reginald Jeeves from page to screen, this was surely the fruits of their labors. There you have an integral element of Jeeves and Wooster's continued appeal: the effortless charms of Fry and Laurie. The duo are so enveloping in their performances that they envelop both themselves and the audience. Much of the enjoyment of witnessing Fry and Laurie bounce off each other's perfectly-timed mannerisms can obviously be traced back to their halcyon Cambridge days, but for us audiences, the seeds were sown with A Bit of Fry and Laurie, and even perhaps a bit of Blackadder. Between those two shows, Stephen and Hugh demonstrated how feather-smooth their on-screen relationship was, which was made all the more apparent thanks to the backdrops of A Bit of Fry and Laurie's harsh deadpan nature, and Blackadder's decadent re-writing of history. Even one-off appearances in The Young Ones and Filthy, Rich and Catflap gave evidence to how the pair were so entwined in each other's comic deliverance. They were the middle class double act that the everyman could be, and were, a fan of. This was perhaps thanks to how self-destructive their pre-Jeeves and Wooster output was in their nature. The satire of A Bit of Fry and Laurie seemed rooted in how the middle class viewed the world -- a world in which Fry and Laurie were perhaps born into -- whilst such appearances on Blackadder, The Young Ones, and Filthy, Rich and Catflap were routinely aggressive, making them perfect additions for such shows. 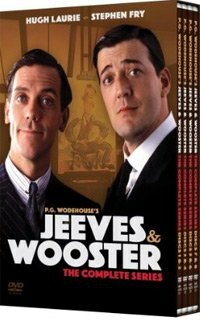 However, just how much of the humor of Jeeves and Wooster is owed to Fry and Laurie? When you remove those two star attractions, do you still have a devastatingly British witty show? In short -- yes. The wit and the charm remain, but after all, how legitimate is a TV show when you remove the main characters? Such as question plays well into the theory that there's more to Jeeves and Wooster than Bertie and Reginald, when this series shows us a world populated by a multitude of jobless yet wealthy buffoons like Bertie, and an army of black-suited manservants on hand ready to pluck said buffoons out of mischief, just like Jeeves. What makes this duo stand out isn't just their actors, but rather, the individuality they have as characters, in both their relationship and their personalities. If you passed Bertie Wooster on the street, chances are you'd find him a somewhat despicable fellow. He remains unemployed throughout the four series, thinks little of the bigger picture, and is incompetent in almost every ill-conceived plan he hatches. Despite all this, he remains an immensely likeable person, perhaps more so than the other young-minded fools he rubs shoulders with. You feel your heart pouring out to him as he's routinely hard done-by by an unstoppable army of volatile aunts and roguish love interests. In the background of all this chaos, you have the unassuming Jeeves, just one fixer of problems who was probably created in a factory somewhere that specializes in churning out manservant after manservant. He's as much the parent of Bertie as he's the sibling, often becoming seemingly intentionally dragged down to the consequences of the shenanigans Bertie finds himself in, whether or not they're his doing. That equality radiates sublimely, due as much to the characters as the actors themselves. Jeeves and Wooster appear to have a far more equal relationship than the other manservant/buffoon combos seen throughout Jeeves and Wooster. Bertie may separate himself from Jeeves when attempting to outdo him with his own plans to either rid himself of the wrong woman or to help others secure the right one. Jeeves often elevates himself to being the superior of the duo by freeing Bertie from the shackles of potential soul-crushing marriages when his own plan go awry. Yet they routinely find equal footing from the episode’s beginning to its end, with the middle displaying their individualities and why they’re both so suited to each other's needs. If anything, Fry and Laurie's effortless contributions almost come across as a refreshing tonic to the oddly regular cast changes throughout the four series. We almost have as many Aunt Agatha's as we do series. Madeline Bassest, Florence Craye, Gussie Fink-Nottle, and Sir Roderick Glossop all suffer the same fate. They're all portrayed by an enormity of actors, who all bring an enjoyably professional attitude to Wodehouse's characters, but some have more gravitas than others. Another jewel in Jeeves and Wooster's crown is scriptwriter Clive Exton. Responsible for scripting all 23 episodes, his stories capture a condensed wit that stays true to Wodehouse's original novels whilst at the same time playing fast and loose with their structure. Stories unconnected in their original novel form are weaved together, two or three at a time, and strung out into cohesive escapades of misjudged marriages, antagonizing aunts, and thefts of policemen's helmets. It's a testament to Jeeves and Wooster's continued appeal that despite Fry and Laurie’s overpowering star attraction, the world of Jeeves and Wooster is as much the star of the show as the lead duo themselves. Outwardly a world dominated by the upper classes, their pomposity is either accepted as the norm or it's glossed over by this world's other inhabitants. For us viewers however, it's laid out in its barest form. We see so much of the ineptness of how this world's populace operate that we wonder how they survive. The elders are only concerned with status and human reproduction. The females appear only concerned with marrying inappropriate suiters in an attempt to mold them into something that doesn't exactly meet their standards, but merely to assert their own dominance, and the men appear only concerned with living in the here and now. The only tug at their 24-hour party lifestyles is that of hopelessly falling in love with some toothsome filly who's either unsuitable, unavailable, or simply impossible. It's an extremely abstract world that masquerades as a low-key imagining of high society. The deft fusion of word-heavy wit and charismatic performances from the cast paint a very clear picture as to why Jeeves and Wooster continues to remain a joy to watch. Perhaps there's more to Jeeves and Wooster than Fry and Laurie after all. By day, Fred McNamara works as a broadcast journalist for local television; by night, he's a vigilante of popular culture. He writes about films, TV shows, comic books and novels for a variety of websites and magazines, including ScreenRelish, Starburst Magazine, and Andersonic. He's also the senior editor for the superhero/indie comic book website A Place To Hang Your Cape.